The Origin 350r is the racing variant of the 300 series. It features dual thrusters instead of a single one in the rest of the ships in the same series. 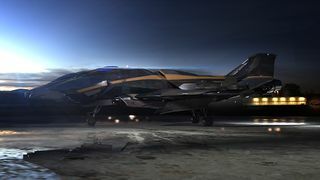 300i: The 300i is the base model of the 300 series. In 2899, the 300 series launched a single model: the 300i. The designer of the 300i, Andreas Lang, was insistent that Origin would begin producing variants in the third model year by designing entirely new models to fulfill different specialized tasks. Origin, remembering the expense of the first prototype and the ensuing battle to lower production costs, balked at the idea. 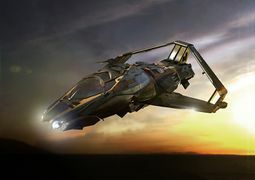 For all of the project’s rhetoric, later amplified by the series’ initial marketing, the company wanted to borrow an important aspect from RSI’s Aurora: a modular space frame designed to easily adapt variants. Like the Aurora, the 300 series would adapt the initial version into a host of different factory models built atop the standard design. By all accounts, the decision to develop variants instead of bespoke models soured Lang on the project altogether. Instead of helming the 2903 model year as previously intended, he built a smaller, separate team to construct the Origin 350r speed model. Not intended for wide sale, the 350r project allowed Lang and his most fervent acolytes a chance to build the high performance ships he desired for the racing circuit. The 350r becomes the first variant of the 300 series. For a full gallery, see :Category:350r Images. ↑ 2.0 2.1 2.2 David Ladyman and Ben Lesnick, Whitley's Guide: 300i, Jump Point, vol. 6, no. 4, pp. 35-38, 2018-04-27.